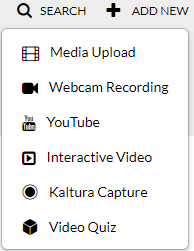 Kaltura (Personal) Capture allows a user to record in various ways and upload the created content to the videoportal afterwards or save it locally. Click on the ‘Add New’ menu option to expand the menu. Tick the box to agree with the terms of service and continue the process. In the popup click ‘Open URL: Kaltura Pe…pture Protocol’ and optionally tick the box next to ‘Always open these types of links in the associated app’ to not get this popup in the future. In the newly appeared section below the terms of service select the appropriate download (at the bottom of the screen) for your computer (Windows or Mac). Select a destination for the file, generally this should be the ‘Downloads’ folder. Either open the downloaded file from the browser by clicking on the downloaded file button on the bottom left of your browser or browse to the file from Explorer or Finder and open it from there. 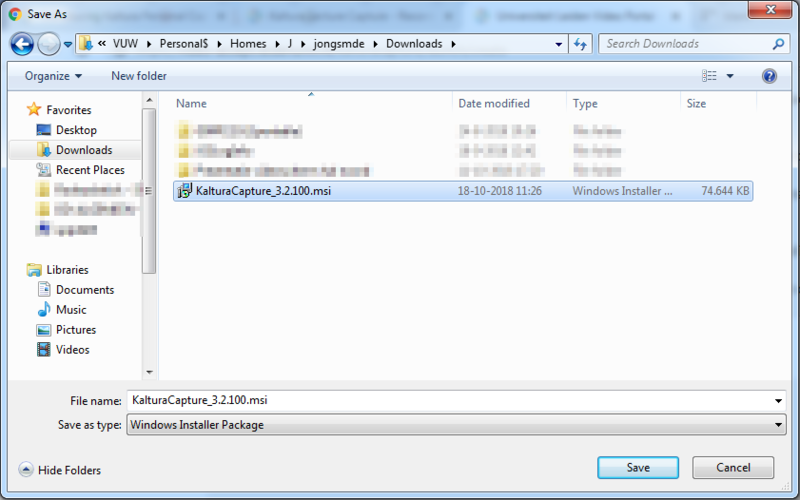 Choose to run the installer and follow the on screen instructions. Once finished installing the application will open automatically. In the screenshot below you can see a big red “Start Recording” button, two screen icons, a microphone icon and the “Manage” button. If by accident you clicked to another window at the time the application opened you can bring the application to view by either clicking on the icon in the taskbar or dock or using alt-tab to locate the application. 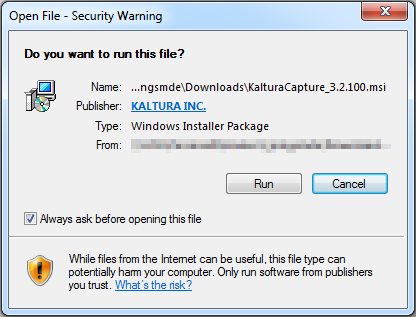 Prior to starting your recording it is a good idea to check the settings tab for Kaltura Capture. 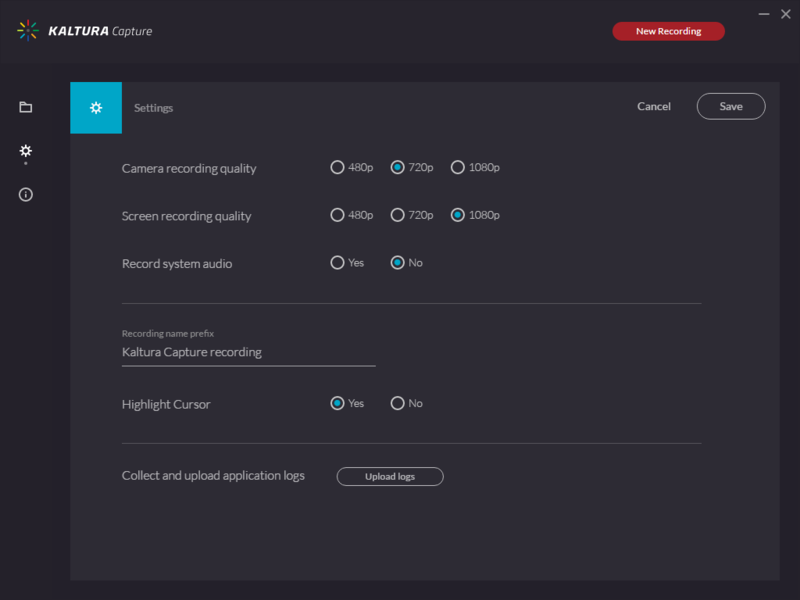 Depending on what you are planning to record you should adjust your settings accordingly and always test your recording settings before putting all the effort into creating a product as the settings might need adjusting to optimize quality and smoothness. Click on “Manage” in the recorder window. In the settings screen you have multiple methods listed with a few options on quality or whether it should record in the first place. The Camera and Screen recording settings are generally fine for most purposes. We would never recommend a lower screen or camera recording quality. A higher camera recording quality however can be beneficial when you want to show objects on camera in detail. In such cases turn the quality up to 1080p! The option to record system audio (this included Windows sounds but also sound on a video you are playing from YouTube for instance) is turned off by default. If for any reason you require system audio to be recorded please turn this option on. “Recording name prefix” allows you to record files with a prefixed title beforehand this option is very useful when you decide to record a series of video’s under the same name. “Highlight Cursor” is turned on by default and will highlight your cursor when you click anywhere on screen (color of highlight can be set during recording). The last option is for diagnostic purposes and should generally not be used unless requested by staff. 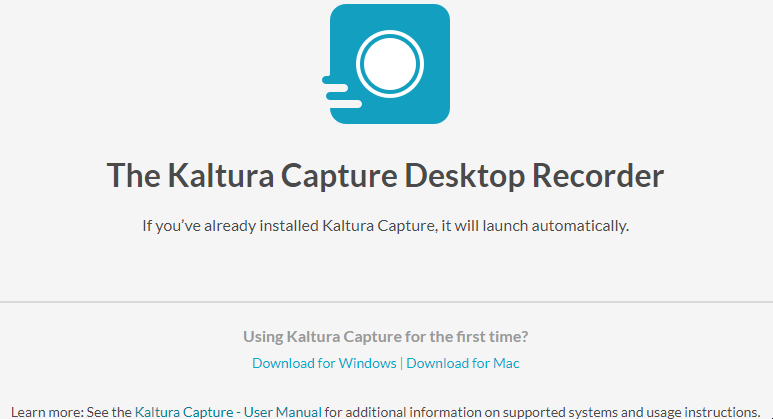 To check your settings please click on the “New Recording” button on the top right of the Kaltura Capture window (see screenshot below) to return to the recording window. Please create a test recording and check the result (please do not choose to upload this recording). You are now ready to learn how to use the application, please follow the instructions of the next chapter to create a (test) recording.